Vargas became an American citizen in 1939, the same year that he received an invitation from Esquire magazine to visit with publisher David Smart in Chicago to discuss the possibility of working together. Vargas and Anna Mae Ciift were married in 1930 and moved to Hollywood four years later. Twentieth Century Fox soon hired the artist to paint pastel portraits of their stars, as did Hellman's Mayonnaise, which commissioned a series of full-length movie star portraits for their advertisements. By 1935, Vargas was working for Warner Brothers and, before the decade was over, for MGM. Vargas' first calendar jobs were two pastel glamour pinups executed for Joseph C. Hoover and Sons between 1937 and 1939. He became an American citizen in 1939, the same year that he received an invitation from Esquire magazine to visit with publisher David Smart in Chicago to discuss the possibility of working together. Vargas was immediately hired as a replacement for George Petty, whose contract was to expire in December 1941. Agreeing to drop the "s" from his last name in all his work for the magazine, he had his first painting published in the October 1940 issue. Two months later, Esquire introduced the first Varga Girl calendar, which sold better than any other published up to that time. Over the next five years, Vargas became known worldwide, and his work, both in the monthly magazine and the yearly calendar, was eagerly awaited. 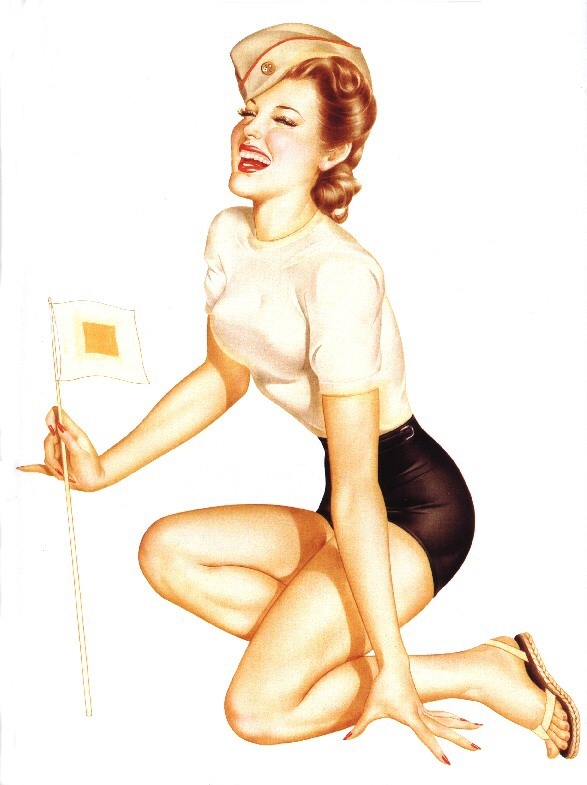 Although he had a full schedule of work for Esquire during the war years, he often, accommodated special requests from soldiers to paint mascot pin- ups. Esquire also allowed Vargas to do a series of patriotic pinups for William Randolph Hearst's American Weekly magazine, the only other magazine work permitted him during the Esquire years. Vargas continued to paint Hollywood stars while he worked for the magazine. His 1941 movie poster of Betty Grable in Moon Over Miami was a great success; among the other leading ladie he painted were such stars as Jane Russell, Ann Sheridan, Ava Gardner Linda Darnell, Marlene Dietrich, Loretta Young, and Marilyn Monroe.